I deleted the Facebook App from my phone (again). I was just spending too much time reading my trash newsfeed. As Aziz Ansari put it, I was on page 1 million of reading the worst book ever. As much as I kept telling myself that I couldn't live without the memes, I know I want to be so much more deliberate with my time. I'm always thinking that I don't have time to blog or read or whatevs because of the kids, but I spend a lot of time on FB on my phone. So I want to replace that with better stuff. It'll take me a while to become unglued from my phone, but hey, it's a start and a step in the right direction. I'm laying here on the couch and the kids are napping, so obviously out of habit, I reach for my phone. Checking Craftster, Instagram and playing Disney Emoji Blitz have taken the place of Facebook for now. I thought maybe times like this would be a good opportunity for me to update my blog. So I just dropped $5 on this app for my phone that will let me blog via the couch without having to run down to my studio and use the computer. I hope this app works better than Google's stupid blogger app. 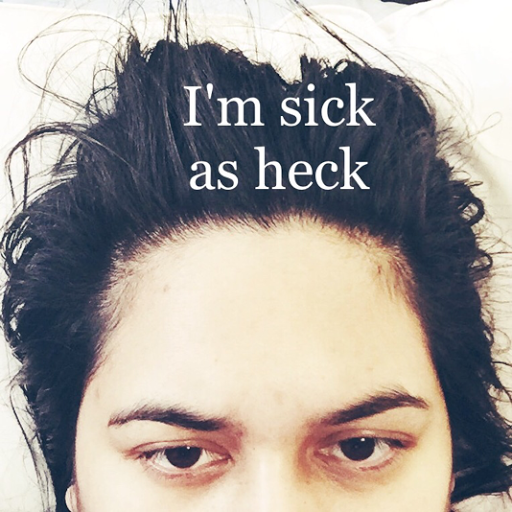 Anyway, I'm sick. I feel like I got pummeled by the Hulk. Now I know why Buddy was such a turd this week. I want to curl up in bed and hide from the world. Instead, I'll mope and update my blog. 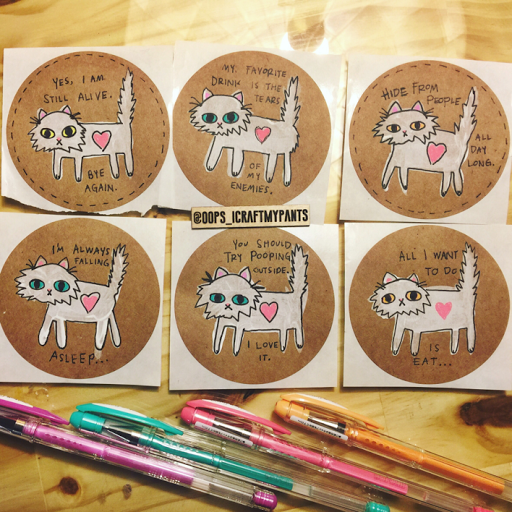 I made these kitty stickers on Friday night. I have a big roll of kraft stickers that I want to start using, so I'm pleased. These will be part of my Happy Mails for my Workspace Declutter Challenge. They're things that I think cats would say, but I think I can relate to all of them. My favorite is the pooping one. I don't poop outside, but would if I had to. TMI! TMI! 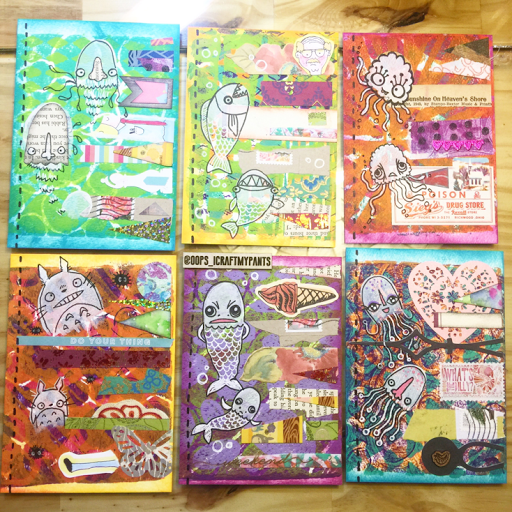 In addition, I completed some other postcards for the challenge also. 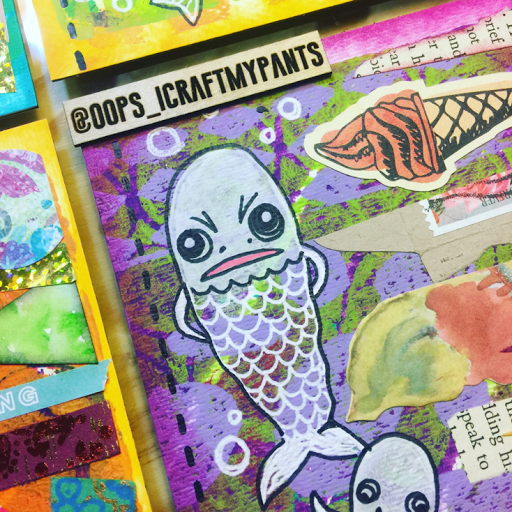 A set of six, using more gelli-print from Audrey. This one is my favorite. This is sass fish. I am sass fish. I want people to treat me right. I want people to be cool. I want a chicken sandwich. I want to nap whenever I want. I want justice. Aren't we all sass fish? Well, until next time. I hope your weekend has been great :) And a little sassy. You're stronger than I. I've frequently considered getting rid of FB and Candy Crush but so much of my social life is tied to FB and Candy Crush is a horrible guilty pleasure. I love your stickers and I agree- the pooping one is fun. Feel better sass fish!